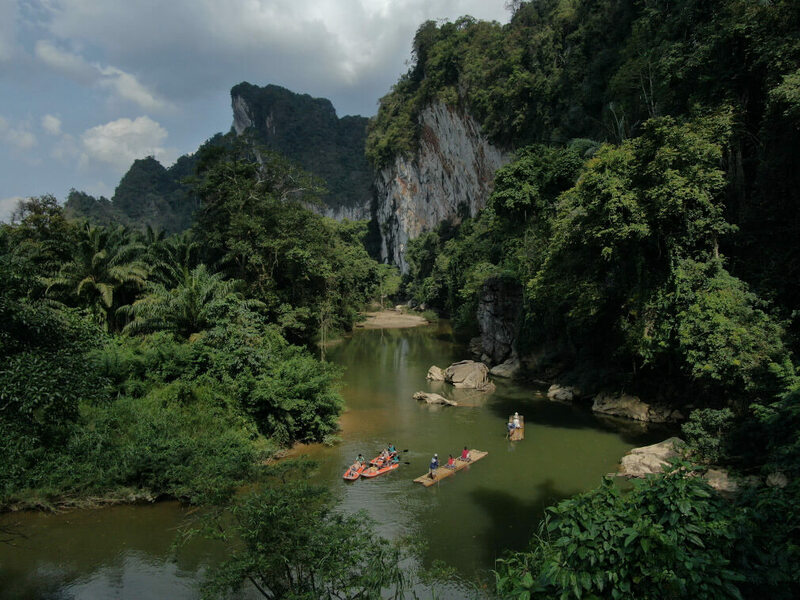 Not so many decades ago, Khao Sok National Park was a region of jungle wildness in Thailand’s Surat Thani Province that very few outsiders knew anything about. The largest area of virgin forest in southern Thailand, Khao Sok only became a national park in 1980, but it wasn’t until the Rajjaprapha Dam opened in 1987 – adding a new water element to the park in the form of the 165 km2 Cheow Lan Lake – that its popularity as a holiday destination for outdoor fun and adventure began to take off. Today the park is almost a household name among travelers to Thailand and its popularity as an outdoor adventure haven continues to grow. While the lake has made some of the remoter parts of the park more easily accessible by boat, there are still many isolated areas that few visitors ever get to see. Here are five things you probably didn’t know about the park, which will give you some insight into its pristine biodiversity and isolated beauty. 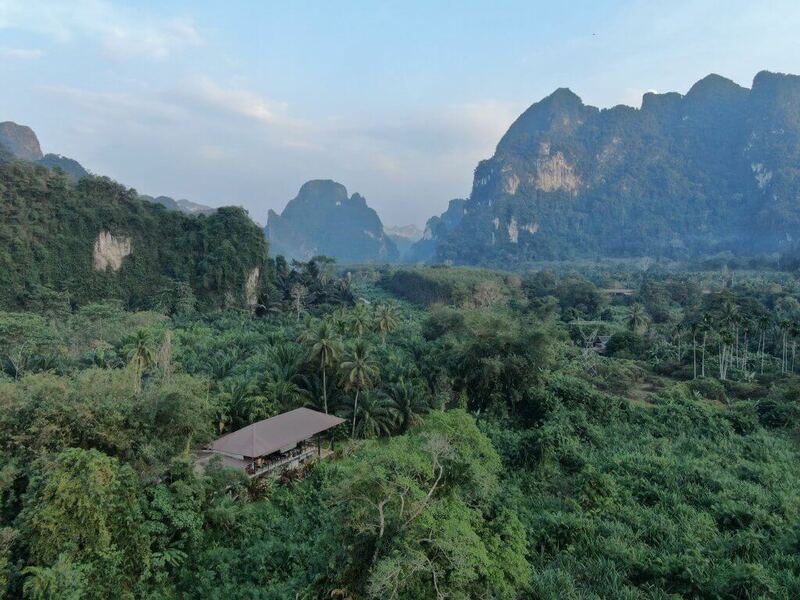 Around 300 million years ago, the Khao Sok Region was in fact under the sea. Warm temperatures combined with shallow waters resulted in the formation of a vast coral reef, which scientists have estimated to be five times the size of Australia’s Great Barrier Reef. Following the collision of the Indian and Eurasian tectonic plates approximately 66 million years ago, the Himalayas were formed and parts of the reef near the continental divide was forced upwards, forming the stunning limestone karst mountains that are typical of the topography in Khao Sok and other parts of the region, including northern Laos and Ninh Binh and Ha Long Bay in Vietnam. Rock climbers who have scaled the soaring limestone cliffs in Khao Sok have also discovered fossils of sea creatures high up in the cliff faces. Khao Sok National Park is home to an amazing variety of flora, but one of the most unusual is a parasitic plant called the Rafflesia. While there are thought to be approximately 28 different species found throughout Southeast Asia, the Rafflesia kerrii is unique to southern Thailand and the Malay Peninsula. What makes it unusual is its giant red flower, said to be the largest in the world, with some specimens found to be over 100 centimeters in diameter and weighing up to 10kg. It has no stems, leaves or roots, and spreads through its vine host, producing little buds along the vine’s length, which after nine months blossom into the giant five-petal flowers. An awful scent similar to rotting meat emanates from the flower to attract flies for pollination. Listed as Endangered, the Rafflesia kerrii only blooms once a year during the dry season from January to March. Although it is naturally rare, tourists often trample on the young buds, while trying to get photos of the plant and locals also collect the buds to eat, which are said to have medicinal properties. The flower is also the symbol of Surat Thani Province where Khao Sok National Park is located. Buttress roots, which grow on the larger, specialist trees, are an important part of the rainforest ecosystem. They grow out from the larger trees horizontally and occur in areas where the soil is shallow and the forest nutrients are found mostly near the surface. Penetrating the ground only up to a few meters they spread out like huge cartwheels. 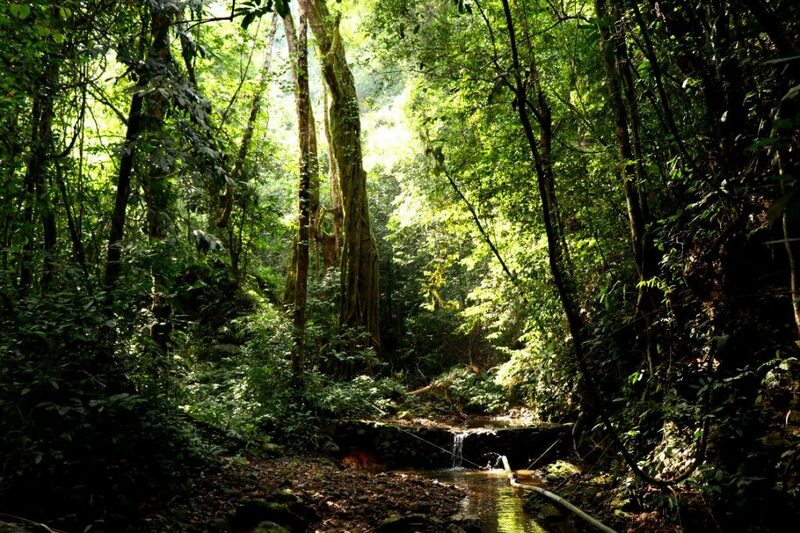 In typical rainforest climate much of the nutrients available to plants come from the leaf litter and not the soil. Buttress roots are therefore crucial in holding together the top soil and ensuring it doesn’t get washed away. If these large trees are cut down and the canopy is lost the topsoil of the forest floor becomes vulnerable to erosion and the important nutrients are lost. Although these trees can grow to an amazing 65 meters, they rarely live longer than 150 to 300 years, and so if their cycle of growth is broken, the forest dies. Lianas, which are various long-stemmed, woody vines rooted in the forest floor, grow quickly by wrapping around any tree for horizontal support and rising into the forest canopy. When tropical rainforest trees are cut down, connecting liana vines are also dragged down with them, causing a cascade of damage to the forest canopy. Dipterocarpus alatus is a genus of flowering tropical tree in the Dipterocarpaceae family of flowering plants. 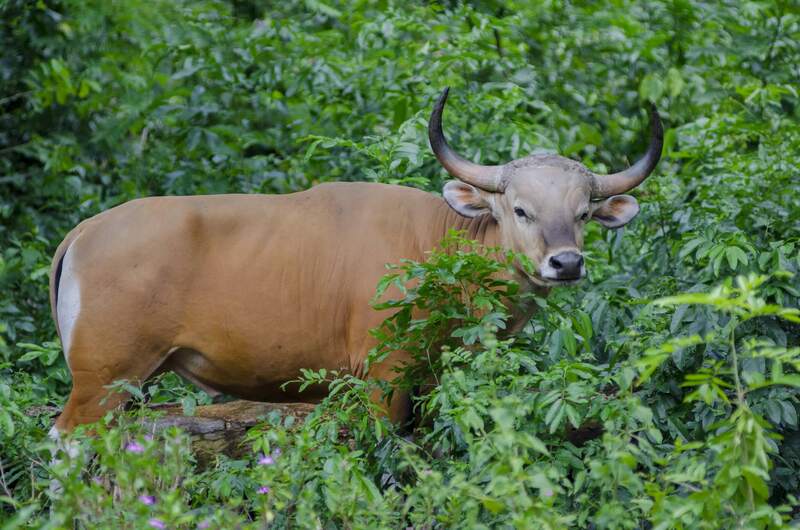 Found in Khao Sok and other tropical forests of Southeast Asia, including Myanmar, Laos and Cambodia, it is listed as Vulnerable on the IUCN Red List. A key hardwood species for regenerating deforested land it has been heavily logged for use in construction and cabinetwork, as well as wood lacquering, and traditional medicine. When mixed with beeswax, its resin is considered to have special properties that are good for ulcerated wounds. The bark of young trees is also dried and boiled into a tea that is used against rheumatism and liver diseases. Growing between 40 to 70 meters in height, the trunks of these trees can reach up to two meters in diameter. Dipterocarp comes from the Greek word meaning, ‘two-winged fruit’, which refers to the tree’s two-winged seeds that are capable of gliding through the jungle canopy. The tree is a crucial canopy tree in Khao Sok National Park that needs to be protected. Other threatened trees found in Khao Sok, include the Hopea odorata, known locally as takhien – a species valued for its wood and believed by locals to be inhabited by a tree spirit known as Lady Takhien. Another important tree is Shorea roxburghii, or pha-yom, which is cut down for its timber and resin. Its flowers have large elongated yellow anthers that attract pollinating bees. Loss of tree cover in Southeast Asian forests is also contributing to declining populations of tree dwelling animals like the gibbon and giant tree squirrel, which feed on the fruit of the Dipterocarpus, as well as other trees. Most travelers who plan to visit Khao Sok National Park, erroneously assume that Cheow Lan Lake is the central attraction of the park, but actually the lake only takes up just over 20 percent of the park’s total 739 km2 area. Situated at the center of five nationally protected areas, Khao Sok is in fact also home to a number of beautiful rivers, including the Sok River, which stretches all the way to Surat Thani town on Thailand’s east coast and was once used by traders to carry goods by raft from the Andaman Sea to the Gulf of Thailand. 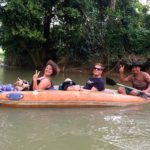 Today the Sok River is an ideal way to experience the park’s stunning terrain of soaring limestone mountains and dense jungle. If you are staying with us at Anurak Community Lodge, you can take part in a number of Sok River activities including our River by Raft and River by Canoe experiences, which take you gliding down the river to discover the wildlife and stunning nature of this ancient landscape – much in the same way that the first traders did traveling from coast to coast. © 2019 Anurak Lodge. All Rights Reserved.